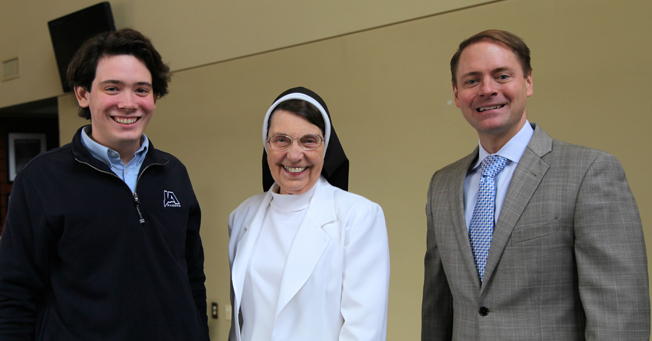 Sister Dorothea Sondgeroth, who served as president of St. Dominic’s Health Services from 1995 to 2012, spoke Tuesday, Dec. 2 to students at JA’s Lunch to Lead program, a regularly scheduled optional program that offers students insights into leadership. During Lunch to Lead, students gather in the gallery of the PAC, are provided lunch, and listen to a speaker experienced in leadership. Sister Dorothea complimented JA students on their warm welcome, something she experiences every time she has been at JA, and also on the student leadership she has noticed at school and in the community. She encouraged students to appreciate and take advantage of the opportunities they had a JA. Good leaders must be people of integrity and truth. Leadership is an action, not a position. A leader is a person who serves others. A leader does the right thing for right reason. A leader is a team player. We have two ears and one mouth to help us listen more than we talk. Make a decision after seeking wisdom and input from others. A leader is not a dictator. A leader brings people together and is not the Lone Ranger. A leader is must have a mission. (Cited the book The Leadership Secrets of Santa Claus.) Santa knows, lives, and exemplifies his mission. A leader knows the way, shows the way, and goes away. A good leader takes responsibility for his or her actions. All people makes mistakes. Be willing to admit them. Always take the high road. Don’t cut corners. Do the right thing for the right reason. Success comes in cans, not can’ts. Don’t be afraid to speak up if something is wrong, even if others disagree. Surround yourself with good friends and mentors. Your reputation, character, and name are more important than money, power, prestige, and fame. Work hard, but keep a balance with outside interests, too.